Dozens, even hundreds, of concrete tombstones draped with brittle flowers and mildew cover the ground; As you walk through the flattened glass, passing by lifeless bushes and trees (not to mention bodies), you can only see a few inches ahead as the foggy mist seems to taint your 20/20 vision. Your keen curiosity and excitement is overcome by the fear of awakening the dead who lay “sleeping” just below your feet. The ghost ridden atmosphere and the echoing sounds of a nearby forest send a slight chill up your spine.This is the typical, spine-tingling sight of a creepy cemetery. For this experiment we will recreate the gloomy, foggy air feature that most cemeteries tend to encompass. Using a little bit of science and a whole lot of imagination, the audience will get to journey through one the spook Mad Science cemetery. 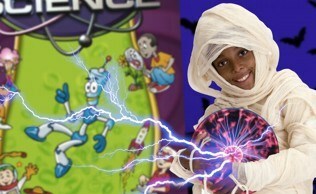 The Cemetery Effect experiment is one of the most popular and exciting forms of Halloween entertainment for kids. 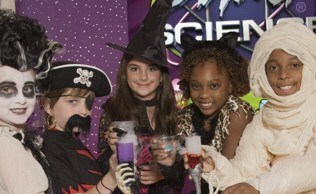 Spaces are limited, book your Halloween party today! The tombstones in cemeteries are believed to keep the ghosts in the ground by weighing them down. The symbol of the cross is one of the most used symbols for tombstone in cemeteries. Writing inscribed on a tombstone is referred to as the epitaph. Empty tombs are called cenotaphs. Many families often obtain burial plots so that the members of the family can be buried all together in one place. The word “cemetery” means “sleeping place”.